Mystery author Vivian Rhodes joins me today to chat about her new psychological thriller, If You Should Read This, Mother. Vivian Rhodes, a graduate of Syracuse University’s Newhouse School of Communication, is a published mystery novelist and two time Emmy-nominated television writer, having written for daytime serials such as General Hospital and As the World Turns. Her Lifetime movie, Stolen from the Womb airs frequently, most recently in May 2016. 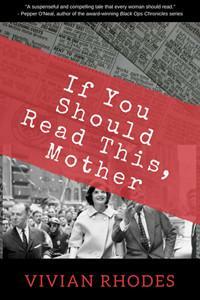 Her psychological thriller, If You Should Read This, Mother is available at www.Blackopalbooks.com, and Amazon, and can be ordered through local bookstores as well. Her novel, Groomed for Murder is now available as an e-book on Amazon, Ms. Rhodes lives in Los Angeles, where she is an adjunct instructor at Cal Lutheran University. She is presently completing work on her next psychological thriller, and writes about all things nostalgic – from film noir to vintage toys – on her blog, Rhodes Less Traveled. Welcome, Vivian. Please tell us about your current release. The protagonist of my story, Megan Daniels, was only three years old the day John Kennedy was assassinated, but flashes of that day begin to trigger other disturbing memories that have lain dormant within her. At first they are merely snippets, but as they begin to appear more frequently Megan has difficulty separating what is real from what is imagined. When she sets out to find her biological mother, she keeps hitting brick walls. No adoption papers exist, and all she has to go on is her possible birthday: November 22. In the small town of Meredith, Megan’s search takes on a dire, domino effect—one woman has already been murdered as a result of her inquiries. As she digs for the truth, Megan eventually unravels a sinister plot that began decades earlier, but in doing so she places her own life in jeopardy. I came up with the idea for IYSRTM one November day when I realized that the number of people who could actually recall where they were when President John F. Kennedy was assassinated was diminishing. Today, it is safe to say, that only a small demographic, those in their sixties and older, can vividly remember what they were doing when they heard the astounding news. What about those people who were alive at the time, but who were very, very young? Surely, they could feel that something was different about that day, even if they didn’t know why. Few cartoons on television over the weekend, if at all. Adults, both men and women, sobbing audibly. The look of disbelief in their parents’ eyes. Wouldn’t those memories remain with them somehow? He never thought that killing someone would have been so easy. Of course, there had been times he wasn’t certain he’d be able to carry it off. First, he had to convince her to meet him in a remote spot. That was an accomplishment in itself, but he’d done it. Then he had to put her at ease. He had to make her feel as though he really cared about what she had to say. And then, when he was sure, really sure that she didn’t suspect a thing, he took aim and fired. It was so deserted; he knew no one would hear the noise. The first bullet grazed her head, and before she had a chance to scream, he shot again. This bullet caught her in the throat as she turned to run, causing a frenzy of blood to come pouring forth. The third, and final bullet, lodged in her skull, killing her instantly as it did. Now to get rid of the body. He was determined to leave no trace of it. I am in the process of editing my latest book, which is also a psychological thriller. It deals with the idea of a woman’s obsession with a man she professes to love. Can this sort of over the top obsession be caused by a particular hormone, and can it lead a woman to commit murder? Ironically enough, even though I had been writing stories, and putting words to music and so on from the time I was a child, and was complimented on my writing by teachers throughout high school, I never thought of it as a serious career option. In fact, I didn’t really consider myself a writer until a professor of mine in a film writing class in graduate school read a script I had turned in and said, “Okay, so apparently you are truly a writer” that I began to identify as one. Then, of course, having my first novel accepted for publication kind of solidified things for me. Writing full time is a luxury I don’t have at the moment. I’ve always loved the scenes in old movies that show novelists holed up in a cabin by a lake, typing away on an old Royal, without a care in the world. Unfortunately, the majority of writers don’t subsist on writing careers alone. The trick is to find something one enjoys to supplement the writing. I am a professional tutor and I teach workshops that specialize in writing. My preference is to wake up very early to begin writing. I’ve been fortunate not to have experienced writers’ block, which allows me to get a lot done in an hour or two. I like to come up with my ending first, so I know where I’m headed. Then I jot down a few chapter ideas and leave it at that. Once I begin writing the rest usually seems to fall into place. Truthfully, I didn’t think too much about it, although Carolyn Keene (author of the Nancy Drew books) and Agatha Christie were both great influences on me in my love of mysteries. In my freshman year of college, when we were permitted to choose one elective, a cute guy, a junior, asked if I was thinking of signing up for “Writing for Television”. When he told me he was, I signed up too, lol. It turned out to be my path. I found out I was really good at writing scripts. The junior? Not so much. My favorite authors are Jonathan Kellerman for suspense, Ken Follett for historical fiction, and the late Maeve Binchy for sheer comfort. Maeve and I became friends several years before her passing. If anyone would like to know more about me, or about You Should Read This, Mother they can access a recent interview I gave at www.kimpaganoshow.com. Thanks for being here today, Vivian.